Dampness is a common TCM syndrome pattern, with signs and symptoms such as: bloating, indigestion, water retention, heaviness, fatigue, mental fogginess, sluggish metabolism, cysts, leucorrhea, achey joints, and stool inconsistency. Related western diagnoses that contain elements of damp include hormone imbalances such as hypothyroidism and PCOS, as well as chronic fatigue syndrome, CIRS, diabetes, IBS, SIBO, candida overgrowth, and weeping skin conditions. According to Chinese medicine damp accumulates in the body and obstructs functioning primarily due to the spleen's inability to regulate water passageways and transform moisture. Additional zang-fu organs that play a role in water metabolism disorders include the kidney, and lung, as well as the san jiao meridian. Note: In western medicine terms the function of the spleen is similar to the pancreas and digestion. When assessing the causes and process of damp we look at our inseparable relationship to environment, diet, and lifestyle. When spleen deficiency is present, coupled with a damp environment (rain, high humidity, cool weather, mould exposure), the syndrome can become exacerbated and increasingly difficult to resolve. Metaphorically, the pathogenesis of dampness is akin to a wet rag hanging out to dry in rainy, cool, cloudy weather -- the wet rag remains damp as it requires sunshine and air (think exercise) to dry! Changing one's external environment isn't always an option however adapting to consistent dietary changes as enhanced by exercise, acupuncture, and moxibustion, is highly effective. Your acupuncturist will work on strengthening the spleen while moving qi and tonifying kidney, lung, and yang energy. How long it takes to heal depends on how long you've had the symptoms for and if your constitution is prone to damp or not. Ask your acupuncturist for further guidance. The list below may seem daunting to begin with. Start slow; the elimination of processed foods, dairy, and sugar are the first to adapt to. Foods naturally high in moulds: mushrooms, sprouts, yeast, conventional corn, peanuts, conventional pork, aged meat and fish, dried fruit, conventional coffee and chocolate, alcohol, bread, grains (except white rice), beans, citric acid, and leftovers. *Quality matters! Fresh organic food that travels a shorter distance and proper drying and storage protects against mould. Foods that you are uniquely sensitive to. An inflammatory response results in fluid release to afflicted cells, causing tissue swelling and abdominal bloating. Excessive intake of sweet flavour, including natural sweet flavours such as fruit. Too many yin nourishing foods. Raw, cold, and frozen food. Excess fermented foods and vinegar. Banana, orange, and overly ripe avocado. Roasted and salted nuts, nut and seed butters. Conventional dried herbs and spices that are over 3 months old. High doses of vitamin C.
Complicated meals with many ingredients. Food for thought: Overthinking, over-working, and worrying can impair the spleen's function. What we think conditions the ability of our body to receive, digest, and absorb food. Pungent vegetables: asparagus, caper, celery, radish, leek, onion, parsnip, scallion, chives, turnip, kohlrabi, winter squash, oyster mushroom, parsnip, plantain, pumpkin, kabocha squash (Japanese pumpkin), and seaweed. ginger, cinnamon, clove, nutmeg, pepper, and cardamom. Turkey (white meat), duck, quail, and pumpkin seed. Bitter and pungent tea: pu'er, green tea, raspberry leaf, dandelion root, etc. Local, seasonal foods. Organic when possible. Note: Talk to your acupuncturist about a damp-resolving plan. There is such a thing as too many damp-resolving foods for certain constitutions. For example, bitter and pungent food flavours which help to resolve damp, when eaten in excess, can deplete qi, blood, and body fluid. Herbal latte's are an ideal 'smoothie' option for those who are struggling with damp accumulation. Teas are an ideal beverage due to bitter and/or pungent astringent properties, their physical warmth, and medicinal nature. For example, the pungent flavour of chai tea is drying and warming, which makes it an excellent attuning choice for the cool and damp environment of my home, Victoria, BC. Why don't smoothies and spleen deficiency mix? Smoothies are typically ice-cold, which have the tendency to put out digestive fire. Typical smoothie ingredients are also fairly cooling and damp, such as banana, avocado, coconut, protein powders, dairy, and nut butters. When consumed, the transformative action of metabolizing food into energy and to regulate water passageways becomes less efficient. Note: Science confirms the effect of cold affecting digestion as cold drinks immobilize immune cells on the walls of digestive track. For example, A study reported in the Journal of Allergy and Clinical Immunology found that the majority of children with milk allergy tolerate heated milk. 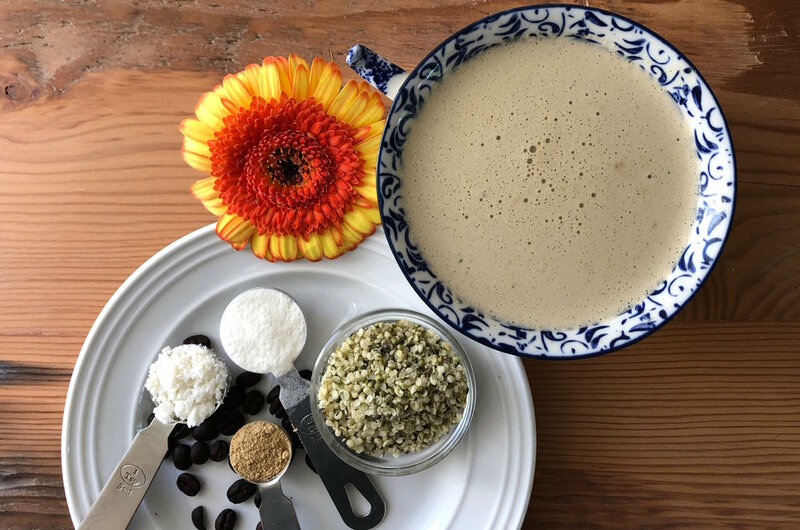 The following recipes help to increase energy in the morning; aim to enjoy a herbal latte 30 minutes before breakfast. Western nutrition benefits include brain and hormone balancing antioxidants, essential fatty acids, amino acids (12 g protein), nourishing minerals, and fibre. Enjoy! Bring 2 cups of water to a boil in a small saucepan. Add loose leaf tea, turn off heat, cover, and steep until desired strength is reached, for example green tea takes a minimum of 4 minutes while holy basil takes 10. *Add the tea that takes longer to steep first. If you are making decaf coffee, follow Aeropress or coffee maker instructions. Pour 1/4 cup of the steeped tea into a protein shaker cup with the coconut milk and collagen and shake to combine. Pour the mixture into the tea or coffee and enjoy. I hope my post has given you insight today. If you’re interested in nutrition and acupuncture I’d be happy to guide you along. Please visit www.vcaspa.com to book online. To learn more about my acupuncture practice, follow @hayley_stobbs on Instagram. Leggett, Daverick. Helping Ourselves: A Guide to Traditional Chinese Food Energetics. Totnes, England: Meridian Press, 1994.